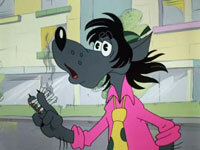 He’s been battered and humiliated for more than 40 years, but the wolf in a classic Russian animated cartoon has skirted the indignity of having to drop his smoking habit. Russian media had wondered if a law designed to protect children that takes effect Saturday could require TV producers to extensively cut episodes of the cartoon “Nu Pogodi” because the villainous wolf is a heavy smoker. The law says material deemed harmful to children can be broadcast only from 11 p.m. to 4 a.m. There was no word if the wolf was relieved. It was scooped up from the sea after 98 years, and now officials say a message in a bottle discovered in Scotland has set a world record. Fisherman Andrew Leaper found the bottle — released in 1914 — in his nets in April while sailing east of the Shetland Islands, which lie off Scotland’s northern coast. 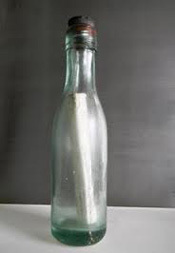 Guinness World Records confirmed Thursday the find is the oldest message in a bottle ever recovered, beating a previous record by five years. It was released in a batch of 1,890 bottles in a government experiment to map the undercurrents of the seas around Scotland. Inside each bottle, a postcard asks the finder to record details of the discovery and promises a reward of a sixpence. Unfortunately for Leaper, the coin no longer exists. A Michigan community that’s fed up with geese fouling up a beach is hoping fake coyotes encourage the birds to land elsewhere. The Livingston County Daily Press & Argus of Howell and WHMI-FM report that the beach on Thompson Lake at Howell City Park is expected to be closed for the rest of the summer swimming season because of elevated E. coli levels. The beach was shut down this month and goose poop is blamed. Debbie Mikula is director of the Howell Area Parks and Recreation Authority. She says the fake coyotes have shown some success in keeping the birds away. They’re being moved at night to trick the geese into thinking they’re real. The hope is that the beach about 45 miles northwest of Detroit will reopen next year. 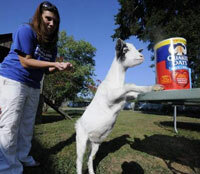 Not wanting to be the people who got Jeff Vlar’s goat, city council members in a Tennessee city will consider an exemption for the animal. The Chattanooga Times Free Press reports the issue is whether a black and white pigmy goat named Oreo can remain in East Ridge as Vlar’s pet. City Manager Tim Gobble says there’s no question Oreo is cute. But he also says the city must either enforce its “no livestock” ordinance or find an alternative. Jeff and Samantha Vlar say they didn’t know keeping Oreo was against the law when they got him for their children a year ago. Mayor Brent Lambert is sympathetic. He has kids, too — the human kind — and says the city is willing to look at a narrow exception for Oreo.